In this era of modern technology, we have seen some truly incredible advances in dentistry. Whereas our grandparents may have been forced to settle for missing teeth and dentures, we have access to excellent preventive care and tooth replacement solutions. Should you suffer the misfortune of a missing tooth, you could just walk into the office of an Anderson, SC dentist, and walk out with a perfect dental implant, right? The answer is yes– and no. On the surface, dental implants are easy to understand. These artificial teeth work and look just like real teeth. An implant is essentially a fake tooth root that is fitted with a dental crown and installed into the jaw bone to take the place of a missing natural tooth. Once it has healed, you won’t even notice that it’s there, it is practically indestructible, and it can be predicted to last for the rest of your life. While this is true, the science behind implant dentistry is far more intricate and complex than you might have thought. The actual implant is made from a light-weight, strong, biocompatible metal called titanium. Dental implants are extremely small (just a few millimeters in width and length), but they can’t be made cheaply. And they shouldn’t be made from cheap or low-quality materials. They must be specially coated to bond with the jawbone and they should be handled in a sterile environment to prevent infection. 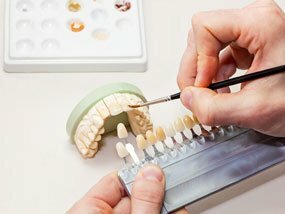 The dental crown that connects to the implant must also be made from high-quality, biocompatible materials. However, unlike the implant post which is hidden beneath the gums and jawbone, the dental crown can be seen when you smile. In addition to functioning properly, it must also look as natural and as attractive as possible. Here is where talented dentists must combine health, science, and art to achieve success. While the procedure is relatively simple and painless for the patient, it is no small undertaking for the dentist or the surgeon. Besides placing the actual implant, additional procedures such as bone grafting or extractions may be required. Years of education and training must ensure that the jawbone is drilled precisely on the first attempt. Any misjudgment can lead to nerve damage, a failure to heal, or an unbalanced bite pattern. When you consider the science behind implant dentistry, it’s easy to recognize the value of your investment. For more answers to your questions about dental implants, contact an Anderson SC dentist today.